Efficiency is one of the most important strengths of a modern subcompact car. Small and sleek, the 2018 Mitsubishi Mirage G4 is a vehicle that's surely designed to navigate cities and suburbs at economical intervals. This lightweight model runs on a 1.2 L I-3 engine block that generates a maximum of 78 horsepower and 74 pound-feet of torque. Such an output is ideally designed for cities that have lots of traffic. The Mirage G4 boasts an EPA fuel economy of 41 MPG on the highway and 35 MPG in the city. A five-speed manual transmission allows you to navigate Albuquerque with confidence. 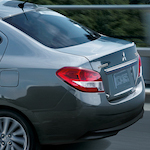 The Mitsubishi Mirage G4 also has a turning radius of slightly more than 15 feet. Such maneuverability is particularly useful on narrow urban roads or in parking garages with tight corners. The Hill Start Assist prevents this subcompact car from rolling backwards while standing on a steep incline.